Vehicles are equipped with high beam lights that are meant for extremely dark driving environments as well and harsh road conditions such as fog and storms. Everyone knows how frustrating it can be to drive down the road only to have someone flashing their blinding high beams into their eyes. When engaged, the high beam indicator will engage. We Offer Coverage for Any Make, Model or Year! Included Introductory Maintenance With All DriveSmart Plans! What is a High Beam Indicator? The high beam indicator light is meant to notify you that your high beam lights are engaged. 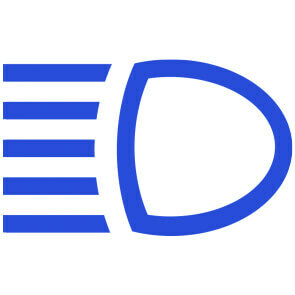 The next time you engage your high beam lights, pay attention for the high beam indicator symbol that typically is blue with 5 lines vertically stacked on the left. What if the High Beam Indicator Won’t Turn Off? The high beam switch/turn signal switch is malfunctioning – The high beam indicator gets power directly from the wire that connects the high beam switch to the daytime lights module. A quick solution to this is to turn the high beams on and off quickly several times, which could clean the contacts in the switch. The high beam bulbs have gone out on your vehicle – Check the actual lights and verify whether they shine properly or not. If you find that they are not shining, it could potentially trigger a false high beam indicator symbol. What if the You Find the High Beam Indicator Light Flashing? A high beam indicator light blinking can indicate that there is an issue with the high beam switch not being properly connected to the assembly in your vehicle. The same can be said for no high beam indicator problems as well. The best solution for this issue is to take your car to a mechanic that will be able to disassemble the switch modules within your car and properly diagnose them. Sometimes they are just found to be dirty, and by cleaning the connectors and other contacts within the switch many will be able to restore the switch back to its original operating condition. However, some switches simply have suffered from an electrical short and unfortunately will not be able to be fixed. If you find your high beam indicator light not working even after cleaning the contacts within the switch itself, it’s a big indicator that you should replace the module. The same goes for those who find the high beam indicator light stays on.